WinBin2Iso converts BIN CD images to ISO images. Files over 2GB are also no problem. When it comes to a quick convert, is exactly the WinBin2Iso conversion tool that you need. This small program converts BIN CD images to ISO images. Files over 2GB are also no problem. When it comes to a quick convert, is exactly the WinBin2Iso conversion tool that you need. 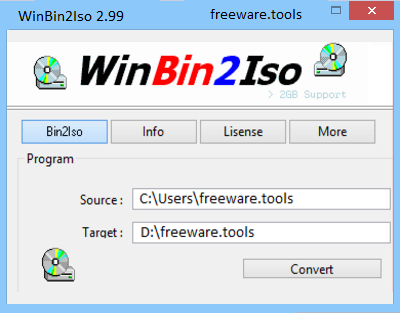 WinBin2Iso is a very simple software solution designed to help you convert BIN files into ISO. Especially designed with this goal in mind, WinBin2Iso is a very easy to use application, so beginners and more advanced users should be able to figure out which feature is which even without a help manual. In fact, WinBin2Iso boasts nothing more than a single main window where the user is prompted to choose the source file and the target, so the whole setting up process takes just a few seconds. There are no configuration screens, which is actually a disadvantage because users may need compression options or other customizations that could offer more control over the resulting ISO file. WinBin2Iso is also able to work with files larger than 2 GB, so the application should have absolutely no problem when it comes to converting DVD images. The conversion process per se goes blazing fast and it usually takes just a few minutes to get the job done, with a minimum footprint on computer resources. Unfortunately, there are things to be improved and the lack of certain features may force some of the users to keep looking for a dedicated tool to convert BIN files into the ISO format. You can't even minimize the main window, so you just have to keep it on top of the screen while the app performs the conversion. Simply put, WinBin2Iso is a useful solution if you're looking for a quick way to turn your BIN files into ISOs. Otherwise, you may have to look somewhere else, especially if you wish to juggle with more configuration options or a more appealing interface.